We monitor all sorts of different breadth indicators in order to get a feel for how market internals compare to moves in the major market averages, and one of the most widely followed of these indicators is the S&P 500’s cumulative A/D line. The cumulative A/D line is simply a running total of the daily net number of stocks in the S&P 500 rising or falling. 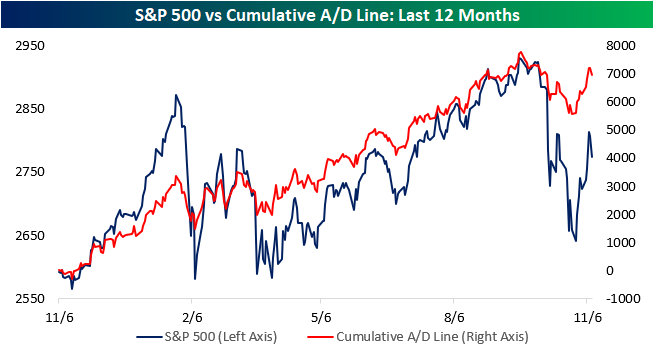 The chart below shows the cumulative A/D line for the S&P 500 (red line) and the index’s price over the last 12 months. At first glance, it looks like the cumulative A/D line has generally been tracking the price of the index during this period, but if you look closely, there are some key periods that are telling. Looking back at the late January through early Spring period, you can see that while equities sold off sharply in the initial leg lower, breadth held up relatively well. In fact, while the first bounce in February stalled out well short of the prior highs, the cumulative A/D line came close to making a new high. More importantly, though, when the S&P 500 tested the February lows, the cumulative A/D line didn’t come close to making a new low, and then the rally that followed, it actually made a new high well before the market. This was a key positive divergence at the time and suggested that the S&P 500 would eventually retake its prior highs. In the current period leading up to the S&P 500’s peak right up until now, we haven’t seen much in the way of divergences in either direction. Both the price and cumulative A/D line of the S&P 500 made new highs on the same day in September, sold off hard, and then in the ensuing rally retraced right around 60% of the high to low decline. Unfortunately, at this point breadth isn’t saying much good or bad. Looking forward, though, the key things to watch will be how breadth reacts if Friday’s decline is the beginning of a new leg lower, or what happens if the S&P 500 rebounds and makes a run for new highs. If you are a bull, you’ll want to see breadth remain above the recent low on any retest of the lows in price or a new high in breadth ahead of a new high in price. Bears, on the other hand, will want to see breadth accelerate to the downside on any weakness and lag prices on any upside.